These are designed for riders who have had limited riding experience and do not own an animal. There are many things that will be learned during the typical 6 to 12 months of the beginner period. You can expect to be an independent, confident rider at the walk/trot and canter with a basic understanding of horse psychology and use of the aids. 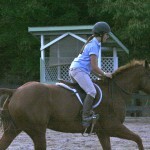 You will have learned how to use your space in the ring, including the usual riding conventions of communal ring work. You will be able to perform a good posting and sitting trot, know what diagonals and leads are and will have covered the fundamentals of pre-jumping, the two-point position, ground rails, and the rules of jumping. 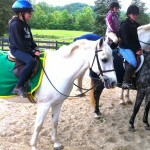 Very young or fearful riders will take a greater length of time to become confident and effective riders. Adults may also have additional fear or fitness issues that may make the learning curve a bit longer. By the time most riders have been riding for 6 to 12 months, it will be easy to decide how serious you or your child is about the sport. Expect to make a decision about the course of your riding experience at this time. For most children riding will become the focus of the literature they want to read, the stories they write and illustrate, and a consuming interest. Given parental support, most children who have an interest will be ready for an animal of their own by this time. This is also a reasonable period in which an adult can gain sufficient expertise to decide if a horse is in their future. After a year of lessons, you will know if this is just fulfilling a childhood fantasy or if it is a viable lifetime hobby or passion. In addition to just plain fun, riding provides a wonderful way to teach children how to work and how to set personal goals. 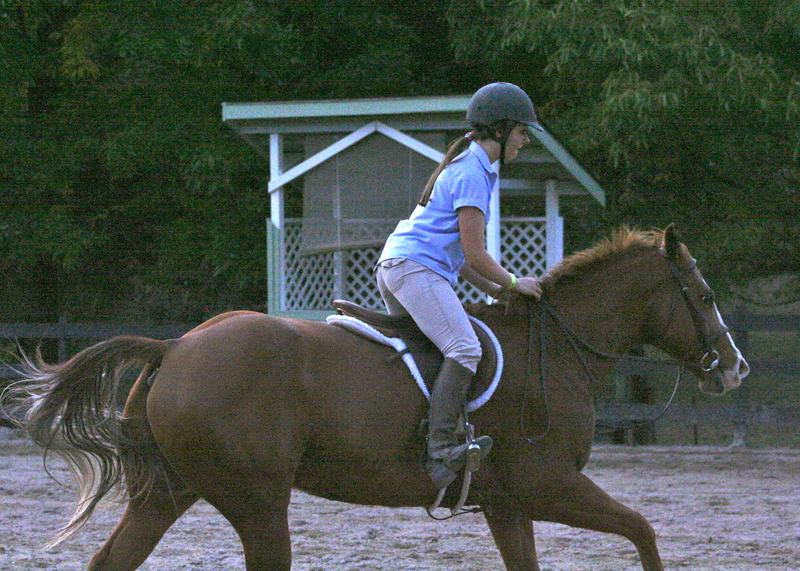 Riding skills and the accompanying self-esteem may have a dramatic impact on their performance in school. Self-confidence and self-reliance are life-enhancing tools for everyone. Beginner adults find that riding is good exercise, social, outdoors, a great focus for energy and a pleasant, peaceful way to spend a couple of hours during the busy workweek. Once riders have passed the beginner phase and have mastered the foundations of jumping, or when they have purchase or leased an animal, they will find the addition of horse shows a great way to give shape to their riding interest. For the more intense equine enthusiast, showing is a logical step. Please see the separate literature on Showing for more information. All Riders may participate in any Fiesta Farm activity, bearing in mind that for those using school horses, there are limited resources which must be shared among the group. Be sure to sign up early for any activity that you would like to do so that your place is assured. 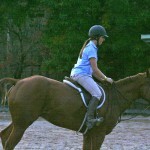 Beginner riders are those who choose not to lease or purchase an animal, and may horse show on a local level. Beginner Lessons are scheduled once or twice per week and are billed in advance. In addition to the lesson fee there is a $20 per lesson school horse fee that enables Fiesta Farm to provide quality horses and ponies for your use during your early learning experience. To give an opportunity for casual riders to safely prepare for riding vacations, camps, etc. This program it is not suitable for very young children as it involves two two-hour blocks of time covering a great deal of material. For riders with short attention spans, children under age six and for those who will learn little in a verbal, survey style setting, Beginner Lessons are recommended instead. About half of the instruction time for each section of the Introduction will be in the barn and about half will be on the animal in the ring. 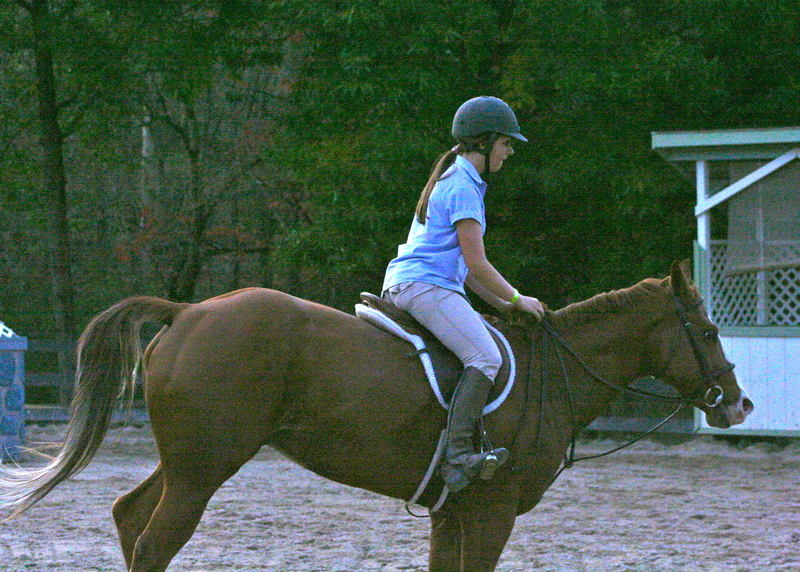 During Beginner Lessons, riders will eventually cover all of the topics offered in the Introduction. However, it will take many lessons and several months to learn all of the material. Therefore, the Introduction is a very good place to start. Following the Introduction to Riding you can expect to know all of the level one testing material. This will include: how to approach and pat a horse, grooming and the tools used, feeding and general care, basic horse psychology (when might a horse kick or bite and what do ears back or tail swishing mean? ), the herd instinct and how horses interact in the wild, how do horses think and do they plan ahead, basic anatomy, their colors and breeds as well as basic parts of the tack and how to put it on the horse. During the Introduction you will get to ride, though mainly on the lounge line. This method allows the rider to feel safe while practicing new skills as the instructor is in control of the horse, very much akin to driver’s training where the instructor has his own brake control unit. You will be taught the proper position in which to sit, how to steer, how to mount and dismount and how to ‘speak pony’ with your ‘aids’. Proper riding equipment is strongly recommended but some latitude is allowed so that you can decide if you want to pursue riding more seriously before investing in the full compliment of equipment. Fiesta Farm does have loaner safety helmets available but these are few and older, so many do NOT meet current safely standards. If you decide not to purchase your own regular riding shoes (called paddock boots) which are hard soled, high top boots, then your own shoes or boots with a smooth sole and high tops are best. As the riding portion of the Introduction will not stress independent riding but rather safety and fundamentals, Fiesta Farm will allow participation in the Introduction before you purchase equipment. Should you decide to delay purchasing proper gear, please be aware that there is some inherent risk taken in borrowed helmets not fitted to you and in using non-standard boots. You must be willing to take that greater risk. Bear in mind that proper equipment is always the safest choice and that you must have it in order to take regular lessons. Please ask for our information sheet on proper lesson attire so that you may make informed decisions when you do buy equipment. The Introduction is $150 per individual and will be offered on demand for one to three compatible individuals. More riders can be accommodated at one time if requested, arranged, and paid for in advance. Sessions can be scheduled for a variety of times but not until after fees have been paid and paperwork has been completed. Show riders are riders who either own or lease an animal of their own and who compete in at least several local and/or “A” shows each year. For these riders, maximizing the horse experience is their goal. These riders need not be riding at any particular level. In order to be successful, riders need only to have a commitment of time, emotional energy as well as financial and family support. The exact program will be tailored to the needs of the individual based on their level of riding, their goals and the allocated budget. Show riders need not be those with unlimited budgets but they must be dedicated and passionate. Testing and conferences will be an integral part of this program and will be most important with this group. Jumping lesson, just before take-off. 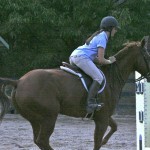 Jumping position lesson; the point of take-off over the jump. Jumping position lesson, the approach to the jump. 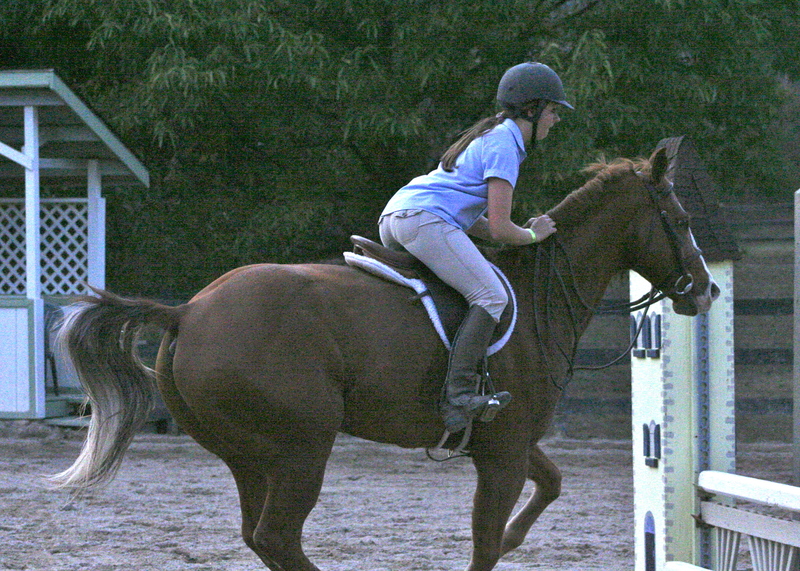 Conferences are encouraged for all riders at Fiesta Farm in order to evaluate progress, set goals, and plot the course for each rider to meet those goals. “Testing” progress – a part of the Continuing Education Program – will also be evaluated to better identify areas for your instructor’s focus. Conferences are the perfect time to discuss your thoughts and ask any questions that you might have about showing, leasing, or buying a horse or pony. Staff is always available to answer your questions and we have many informational pamphlets for your perusal. Do not hesitate to ask if you have questions. We are a service organization and work to make sure that you have the answers and information that you need to make informed decisions about yourself or your child. This is a full curriculum consisting of many individual enrichment elements including: seminars, guest speakers, lounge line lessons, and an extensive lending library in the barn filled with novels, histories, classic instructional guides as well as a large selection of video material. 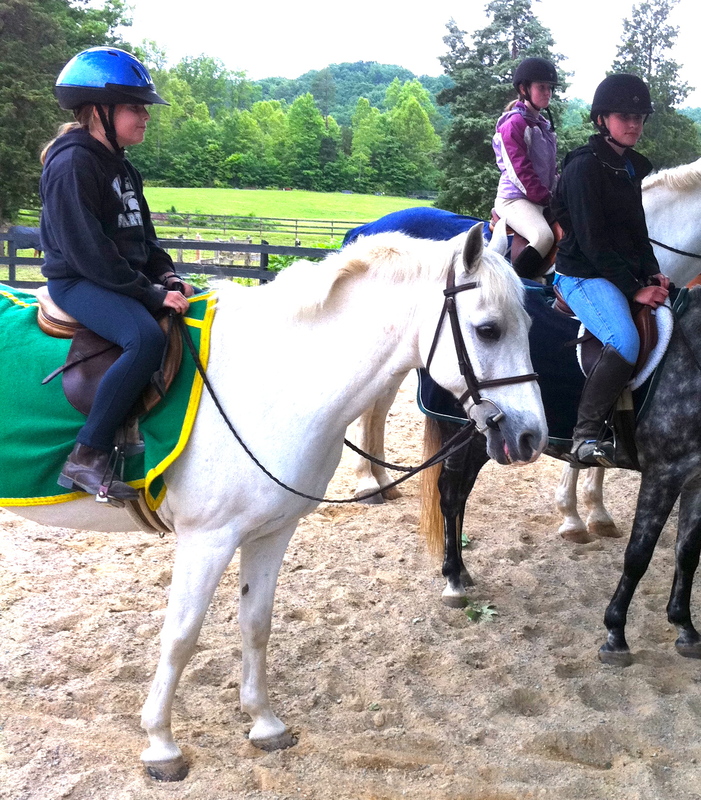 This program is an integral part of riding at Fiesta Farm and is not optional for riders between the ages of five and high school graduation. The goal of Fiesta Farm is to provide as rich a learning experience as possible and while there may be many activities that do not appeal to you; there should be a variety that become favorite horse moments. During the summer months while school is out, the Continuing Education Program will include a special event on most Tuesday evenings during June, July and early August. In the past we have hosted sidesaddle clinics, polo demonstrations, game nights, dressage instruction, resistance-free training, practice horse shows, driving lesson and veterinary lectures, pool parties, sleep-overs, pot-luck dinners, mini-camps, cross county jumping, and many more. Each event is a lot of fun as well as an educational experience. Riders and their families are encouraged to attend as many events as possible. As in any educational environment, the greater the number of different styles and types of riding you are exposed to, the better your overview and ability to make rational decisions for you and your horse. As far as we are aware, this program is unique to Fiesta Farm and will only become richer and more developed with the input and enthusiasm of the Fiesta Farm community. Please feel free to let us know of areas of interest to you so that they may be integrated into our milieu.